Together they will bring the global employment program to thousands of young Italians. 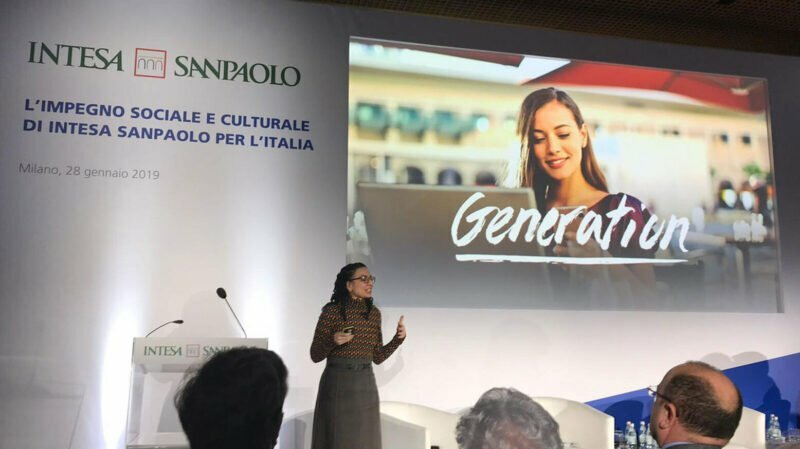 Earlier today, Intesa Sanpaolo, the leading banking group in Italy, and Generation Italy announced a partnership to help tackle the problem of youth unemployment in the country with a pragmatic approach which establishes a link between the demand for skills, the profiles companies want to hire, and the places with a high number of unemployed young people. The announcement was made during the event “Social and cultural commitment of Intesa Sanpaolo for Italy” which brought together various international leaders including Mona Mourshed, Generation’s President and CEO, Rob Kapito, President of BlackRock, and Andrew Morlet, CEO of the Ellen MacArthur Foundation. The morning was dedicated to a discussion of the increasing role of business in tackling the most challenging issues of our time, and Intesa Sanpaolo presented and discussed its own commitment to the community. “Development is linked to the education of the next generations and to the circular economy. Intesa Sanpaolo takes on economic and social challenges for a new growth perspective.” said Carlo Messina, Managing Director and CEO of Intesa Sanpaolo. In partnership with Generation Italy, Intesa Sanpaolo aims to help unemployed young people that want to begin a professional and personal career path, building on the bank’s track record of commitment to social impact. Generation is a global youth employment program that recruits, trains, and places young adults in jobs through a proven approach. Of the 25,000 young people that have graduated from Generation programs all over the world since its inception four years ago, eighty-two percent have been placed in jobs within three months of program completion and cumulatively they have earned more than $75 million in salaries. Generation Italy launched in 2018, making the global program available to Italian youth who are struggling with an unemployment rate well above the European average. With this partnership with Intesa Sanpaolo, over the course of three years, Generation Italy will train approximately 5,000 young people in areas with the highest number of youth unemployed across Italy. Generation Italy will provide short, intensive training in the technical, behavioral, and mindset skills for professions highly in demand by the Italian economy. Curricula will be developed hand-in-hand with employers and participants will receive support during the program, including mentorship that will continue even after they start to work. For more information about Generation Italy, visit generation.org/Italy.